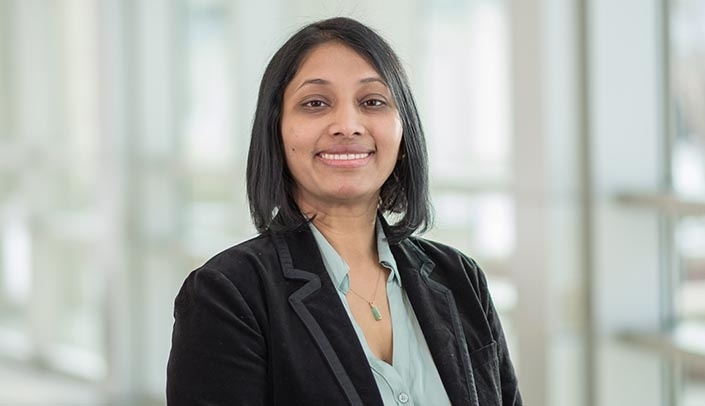 New investigator: Sowmya Yelamanchili, Ph.D. This profile is part of a series to highlight the researchers who will be honored at a ceremony for UNMC's 2017 Scientist Laureate, Distinguished Scientist and New Investigator Award recipients. Understand the role of microRNAs (miRNAs) and extracellular vesicles (EVs) in neurodegenerative disorders such as HIV-associated neurocognitive disorders (HAND), a condition comprising a spectrum of brain dysfunction during chronic HIV infection and further exacerbated by the psychostimulant methamphetamine. While our works in vivo (rodent, non-human primates) have identified novel EV-associated miRNAs, our in vitro works have further studied the underlying mechanisms during disease manifestation. My laboratory has recently for the first time elucidated that EV-associated microRNAs can elicit neurotoxicity in models of neuronal injury including HAND and in rodent models of traumatic brain injury (TBI). Current ongoing works are focused on elucidating the role of cargo molecules, which are expressed on the EVs, and how they impact brain function in HAND and TBI. In addition, my lab also focuses on developing novel in vitro and ex vivo model systems to understand brain function during development. Drug abuse is a serious problem and a significant contributor to neurodegenerative diseases. My research goal is to understand how both acute and chronic drug abuse changes not only brain structure but also its function. The knowledge gained through our studies could be used for translational works to develop novel therapeutic targets and therapies for drug addiction. I paint and love oil painting -- mixing of colors in oil is magical! Mountains are my favorite getaway! Congratulations on your achievement. I am really proud of you. It is a real great honour for you . You have always steuggled hard for this kind of achievements. Keel going . Great pleasure to see sowmya @ this point. May God bless u. Thank you all ! Truly a pleasure to work at UNMC. Congrats Sowmya! You've worked so hard to get here! Congratulations Sowmya! Very well done. I know how hard you work. Much success going forward. Congratulations Dr.Sowmya, very happy for you! Hearty Congratulations Sowmya for receiving young investigator award, a well deserved achievement. Wish you more success in future! A campus ceremony will be held 4 p.m. Feb. 13 in the Durham Research Center Auditorium to recognize the scientist laureate, distinguished scientists and new investigators, as well as the winner of the Community Service to Research Award, who will be announced later. A reception will follow.